Vittorio Giuseppe DeBarbieri first appears in the Painesville, Ohio, area between 1904 and 1917. In America, Vittorio Giuseppe DeBarbieri was known as Victor Joseph DeBarbrie. Vittorio Giuseppe DeBarbieri, son of Giovanni DeBarbieri and Rosa Gusnari, was born on March 12, 1896, at Genoa, Italy. Vittorio died in February, 1979, at California at age 82. 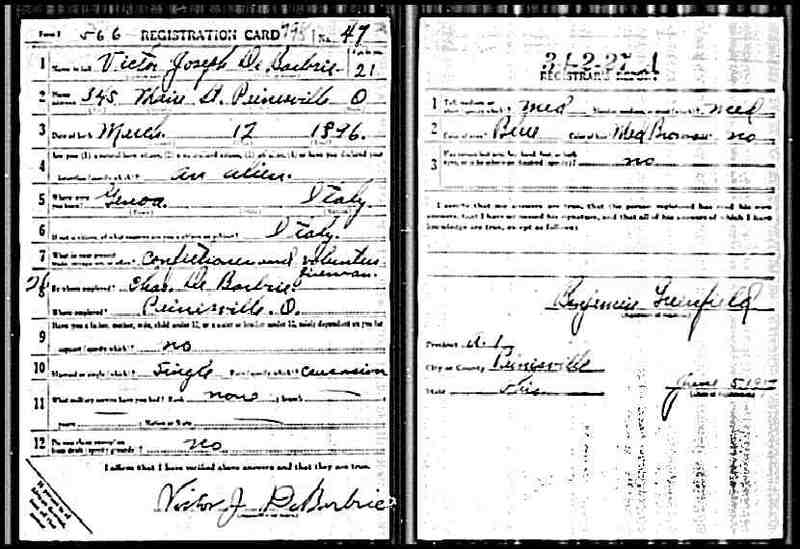 He immigrated to the United States on May 5, 1904, at age 8. 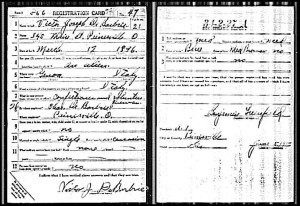 Vittorio Giuseppe DeBarbieri registered for the World War I Draft on June 5, 1917. He was living at 345 Main Street, Painesville, Lake County, Ohio. Victor was working in a confectionery store owned by his brother, Charles DeBarbrie. Charles DeBarbrie was born in 1887 in New York City. The DeBarbieri Family was one three Painesville Italian families from the Provence of Genoa, Italy. These families were related by marriage. Painesville Italian Antonio Gardella was born in Neirone, Italy, and also operated a confectionery store in Painesville. Giuseppe and Andrea Schiappacasse were both born in Neirone, Italy, and lived in Painesville.